Size: Inside 11.5" x 8" x 10"
Available From NC, so No Florida Tax is Required!! 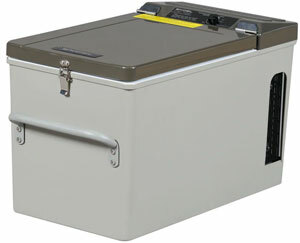 This Engel Medium 12-Volt Refrigerator/Freezer Model MT17 with a 16 Quart Capacity is a compact powerful AC/DC refrigerator freezer capable of freezing almost anything. 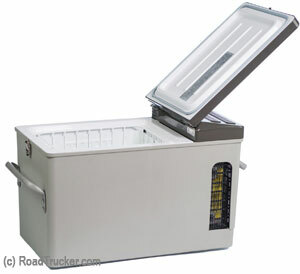 It is ideal for making ice or quick freezing provisions. The new MT17 replaces Engels MT15 - and offers new more efficient compressor, upgraded stainless hinges and convenient carry handles. The warranty is now 2 years. A nice feature Engel's Medium 12-Volt Refrigerator Freezer is that it will run on both 12-Volt DC Current and from a 120 Volt Household plug, switching to 12v on power outages..